When will my photos be delivered to my school? Photographs are dispatched approximately 25 working days from the final day of photography. Please note however, schools often have additional photo days after the main day of photography - sometimes weeks after main day. advancedlife cannot proceed with the manufacture of photo packages until package cover designs are finalised, all photographs have been taken, names and data have been proofed, and everything has been approved by your school. Simply return your unwanted portion of your package within 14 days of receipt along with your: name, address, email, contact phone number and a description of your payment method to receive a refund of your package. Please note: A refund cannot be given if the high resolution digital file has already been downloaded. Whilst every effort has been made to capture a perfect "moment in time" image of your child, at times a photographer can miss the perfect moment amongst the hundreds of children being photographed on the day. Unfortunately, advancedlife cannot return to a school to re-take a portrait. We do, however, offer re-take days throughout the year at all of our regional offices should you wish to come in and have your child's portrait photo re-taken. Unique advancedorder code: This is a secure 9 digit code that is unique to your school. The advancedorder code allows all members of your school community to have access to your school advancedorder site to order their child's photos. All purchases made using the advancedorder code will be returned to your school for secure distribution. Unique student code: This is a secure 9 digit code that is unique to each student. This code can be found on the back of any purchased package distributed by your school and gives individual families access to the advancedyou site (personal site) where you can view images of your child's portraits and group photos and purchase past images and customised gifts. Please note: advancedlife cannot give this code out over the phone. It must be distributed by your school to ensure your child's security. Why is there a $1 online processing fee? A $1 online processing fee is applied to orders placed online. The online processing fee covers the cost of providing online payment solutions charged to advancedlife by our e-commerce providers. The payment processing fee applies to any purchases by credit card, debit card or PayPal made online. Can I order sibling photos? To ensure your school is advised to bring together your children so their sibling photo can be taken, you must order prior to the main day of photography. We provide the school with the list of sibling orders right up to the day of photography, so no one misses out. If you do miss the deadline for ordering, you must instruct your school to make sure that your children still have the sibling photo taken and you can order after the day of photography. Sibling orders must be placed prior to midnight on the day before photos are scheduled to take place. If your school permits sibling photographs to be taken, the easiest way to order is online. Sibling order envelopes can also be collected from your school office and returned prior to photo day, if you prefer to order using an envelope. Late Sibling Orders: If sibling photos have closed, these photos can be purchased at a later date, providing a sibling photo has been taken. When the photo packages are distributed by your school, you will receive a slip advising you that a sibling photo has been taken. All the details of how to order the sibling photo will be outlined on this slip. How do I order sibling photos after the online order cut-off time? Sibling photographs can still be ordered up until photo day by using a "Sibling Photo Envelope". This envelope requires you to pay by cheque, cash or money order. Credit cards can only be used when ordering online through your school's advancedorder site. See your school office to obtain a Sibling Order Envelope. Important: Regardless of the payment method you have chosen when ordering a sibling photo, please ensure your eldest child is aware that they are having a photograph taken with their siblings on photo day. Please note: Not all schools offer the opportunity to have sibling photographs taken. Where will my photos be sent? All orders placed using your school "advancedorder code" will be returned to your school for distribution. All orders placed using your advancedyou code will be returned to the home address listed by the person purchasing the photos. Why am I being charged to download my child's portrait image? Free portrait image downloads are only available at no charge if you originally ordered a photo package that included a separate portrait page and you download the image prior to the following year's school photo day. Once the following year's portrait photo of your child has been taken and purchased, that image becomes your new free image. How can I order after photo day? You can still order photos after photo day by going to your school's advancedorder site and entering the 9 digit advancedorder code, which will give you online access to easily purchase photos. Or you can wait for the school photos to be delivered to the school when you will be given a "Urgent Action" / "Don't Miss Out" card that will have a picture of your child and a unique code to access your child's personal advancedyou online site. This unique personal code can also be found on the back of packages you have purchased for your child in previous years. Please note: Orders placed after photo day will attract a late order fee. Why did I get a 'Don't Miss Out'/ 'Urgent Action' Card? All students are photographed and given a card with a unique number. There are many reasons why we hand these out. For those students who did not place an order, the card offers another opportunity to purchase photos. This gives you the unique code to download your free image, if you have purchased a portrait and group package. The card also gives the families a chance to look at all the photos that advancedlife have taken and have the opportunity to purchase them. How can I order extracurricular photos? Once all the photos taken by advancedlife at your school have been uploaded to the advancedorder site, you will be able to view them and purchase them using the school's unique 9 digit advancedorder code. Your school will email you to let you know when these photos have been uploaded and are available to view and purchase. Our ordering site is dynamic and responsive across home computers, mobile phones and tablets with internet or Wi-Fi access. If you do not have internet connection, the local library, internet cafe or a friend may be able to help. If you place an order after photography day for packages, sports groups, extra-curricular groups or event photographs through the School advancedorder site, your order will be delivered to the school. If you order any of these through the advancedyou personal site using the unique 9 digit code for your child (found on your photography package or advancedyou card), your order will be delivered to the address you supply on the site. The most common problem is caused by using out of date browsers, such as older versions of Internet Explorer. 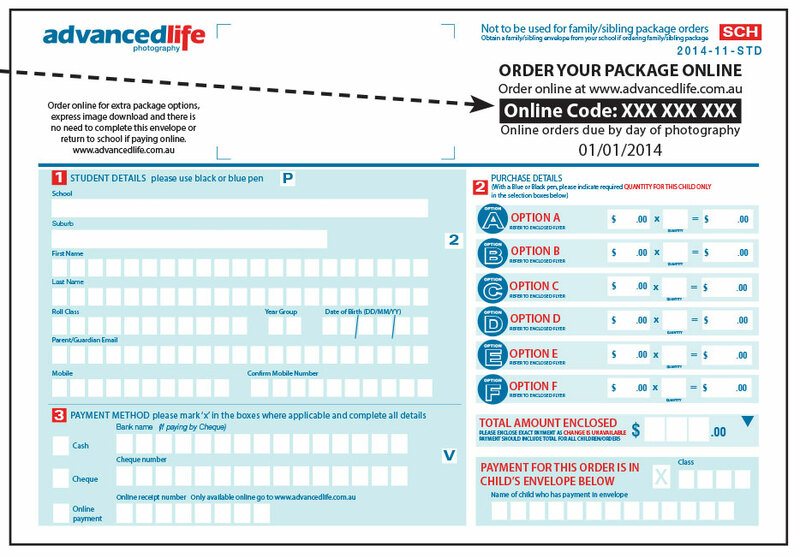 Please update your browser and re-enter your 9 digit advancedyou code at www.advancedlife.com.au. Follow the prompts to download your image. Please ensure you have checked your "Junk" email folder, as the attached image may have gone to this folder. The current year's image is complimentary if you have purchased a package that includes a separate photographic portrait page. This image will remain complimentary for download until a newer image is added, usually this is the portrait image photographed the following year. Past archived images are $8, if you originally purchased a package that includes a separate photographic portrait page. Past archived images are $20, if you originally purchased a package that did not include a separate photographic portrait page. Why is one or more years' images missing? Your child may have been absent on photo day on that year. There may have been an issue or changes with the data supplied to advancedlife that prevented an image from being linked correctly. Unfortunately, if this has occurred there is no way to re-link the image. Your school may not have had photos taken by advancedlife that year. A preview of your design is provided online to enable you to check your order prior to purchase. advancedlife takes no responsibility nor will provide a refund if you change your mind about a product you have ordered or if you have made an error when designing your item or used an image that has not reproduced correctly. If your item is damaged during delivery, please photograph the damaged item and notify us by email within 7 days of receipt. All refunds on items damaged during delivery are made at the discretion of advancedlife.